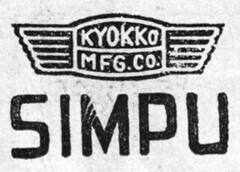 Kyokko logo and Simpu trademark. Kyokutō Kōki Seisakusho (極東光機製作所) was a Japanese camera and lens maker in the late 1930s. The company entered the camera market in 1937 with the Semi-Tex, a 4.5×6cm folding camera copied on the Ikonta. It used the short name Kyokkō (極光) and a logo depicting a cemented doublet with two wings, reading KYOKKO MFG.CO. It made the Simpu lenses for the Semi-Tex, and perhaps for the Pilot Ref. The company also announced a 6×6cm TLR called Simpuflex in August 1937, which was never released. In 1941, the Semi-Tex was attributed to Nomura Seisakusho, perhaps the new name of Kyokutō. Some recent sources attribute the Vester-Lette 4.5×6 folder to Kyokutō, but that camera was actually made by Ginrei. ↑ Column in Asahi Camera September 1937, p.524. ↑ The name "Kyokkō Shōkai" (旭光商会) found in this page of the AJCC is certainly mistaken. ↑ Advertisements in Asahi Camera August 1937, p.A75, and September 1937, p.A74. That dated September is reproduced in Kokusan kamera no rekishi, p.80. ↑ "Kamera no kōtei kakaku kanpō happyō", November 1941, type 3, sections 3A, 4A, 6A. ↑ Kokusan kamera no rekishi, pp.340–1; Sugiyama, item 4068; McKeown, p.592. Asahi Camera September 1937. "Atarashii kikai to zairyō" (新しい機械と材料, New equipment and machinery). P.524. This page was last edited on 26 February 2019, at 11:33.